Lelean Memorial Under 19 side after winning Powerrade Super Deans rugby championship under 19 semi final 12-6 over Nasinu at Buckhurst ground on August 4, 2018. Photo: Ronald Kumar. 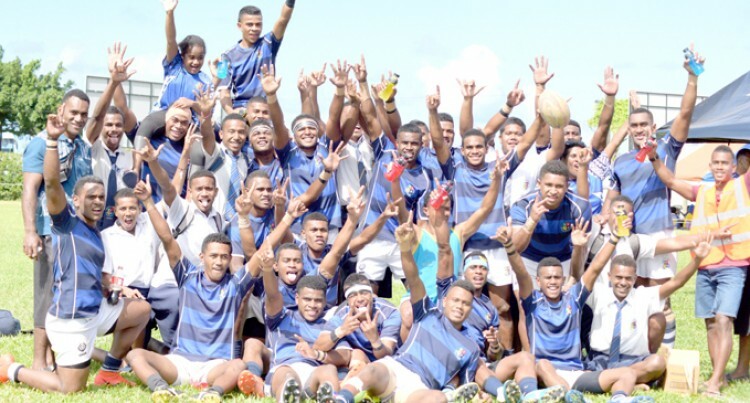 The Ratu Kadavulevu School Under-19 players were in tears after they walloped John Wesley College 22-3 in the Powerade Super Deans Champion­ship semifinal yesterday. Speaking to SUNsports, RKS U19 coach John Livi said majority of their players were playing in the national championship for the first time and their reaction was as if they had won the final. “Despite being the defending champions we always go in as un­derdogs,” he said. “Assistance from a group of for­mer students from the class of 2000 has kept the team together. “Some of the players were in the under-18 last year while for others this is their first time. Livi reiterated the Bible verse of James 4:10, which has been inspir­ing them all along. “This verse was what we abided ourselves with. “This is a national competition and all teams will be preparing well and we cannot deny the fact that John Wesley was the better side before the game. Meanwhile, in other semi-final, Lelean Memorial School edged out Nasinu Secondary School 12-6. LMS U19 team manager Jiuta Gasai said discipline is one factor that they would need to work on. “From the match two of the play­ers were shown yellow cards and I think going into the final against RKS we will need to work on it. “Playing the defending champi­ons will not be easy so we better come prepared,” he added. RKS have qualified for the finals of all grades except of the U17 where they lost to Marist Brothers High School in the quarterfinal last week.